Fans of Kim Kardashian not pleased with her new long hair debut. Debuting a unique long hairstyle that gave her a Rapunzel look, Kim Kardashian's fans display their expression of dislikeness on social media as she flaunted a new hairstyle. 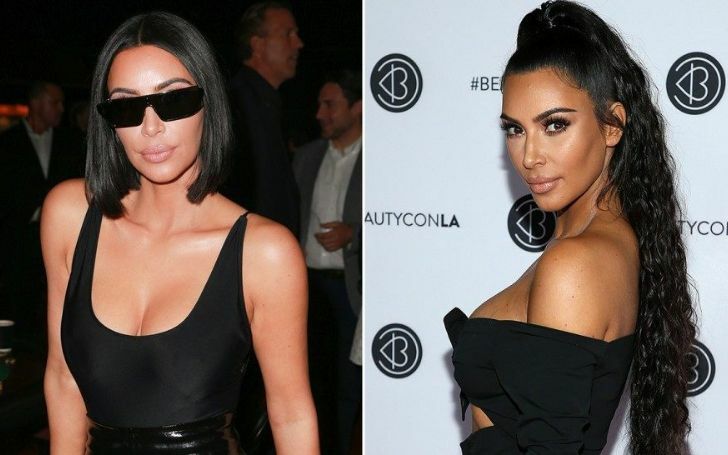 It's no new thing to see the 'Keeping Up with the Kardashians' star who is fond of perceiving herself in new styles and trends regularly flaunting different looks. This time, however, the fans who would regularly praise Kardashian rocking unique styles and fashion choices appear to despise her latest hair look. The 38 years old reality star recently debuted a new hair look and of course, the social media diva had to take it to Instagram so she could show off her brand new hairstyle. Sharing the image to her 133 million followers on the photo-sharing app, it showcases Kardashian flaunting her super long Rapunzel extension attached to her scalp. Kim wrote in the photo caption: "I can’t wait for you to see the @carolinalemkeberlin press boxes.... #Lemke_Partner"
Donned in a black transparent black top and matching shorts, Kim undoubtedly looked glamorous and on top of it, to give a daring look, the mother of three accessorized the Instagram look with a dramatic oversized pink framed shades. Exposing her contoured cleavage in the revealing lacy two-piece outfits, Mrs. West accompanied the daring look with a sheer black stocking. However, instead of heels or some fancy shoes, Kim completed the look with a pair of white furry indoor shoes. Kim posted the radiant picture to show off the shades she's wearing in the image sponsored by the brand product, CAROLINA LEMKE. Surprisingly, in addition, Kardashian's extremely long extension comes in a length of 65 inches. Yup, we ain't kidding. Like as you see in the picture below, the edge of the hair almost touches her feet. Kim Kardashian flaunts her 65 inches long hair on social media. Meanwhile, despite looking absolutely stunning, it appears her followers didn't seem to appreciate her new hairstyle. The post, in fact, led to tons of negative remarks in the comment section with one writing: "fire your stylist." Among the thousands of comments, one similarly read: "Sorry but don't like all that hair,' whilst another one's read: "the hair freaks me out lol"
Likewise, a third comment read: "Chop off your fake long hair. Absolutely hideous." On the other side, some of the commenters didn't even hesitate to troll her outfits and the entire look. Funnily, one person commented: "me in the morning deciding what to wear," whilst another one joked: "me walking around my room getting ready for school while my mom ironed my shirt and skirt." The picture comes shortly after her sister Khloe Kardashian received backlashes for wearing a golden brown big curly blonde hair extension at the 75th birthday party of Diana Ross. People clearly didn't seem to be impressed with Khloe's curly hair look as some of them even accused the mother of one with cultural appropriation. However, this is not the first time Khloe faced criticism on the internet. Just last month, the 34 years old reality star suffered harsh comments that claimed she was being insensitive to a fan who wrote to her that she needed to work extra twenty hours just to be able to afford her Good American denim jeans. And in response to the fan, Khloe replied writing: "Awwwwww this is so cute!!!! I’m so happy you enjoy them." In Other News: Days After Being Spotted with her, John Cena's Mysterious New Woman Identity Revealed; Who is she? Khloe is yet to reply to the backlashes.